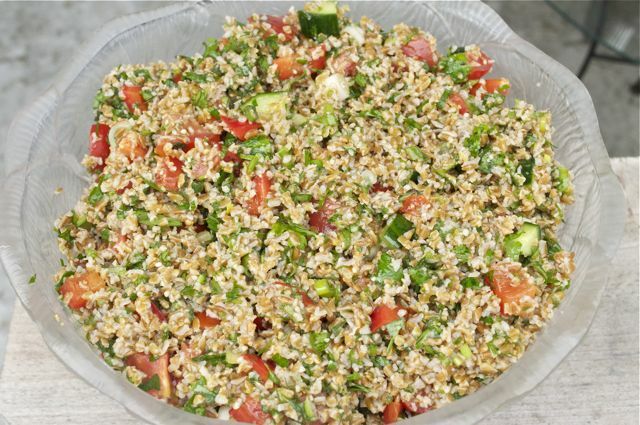 Whole-grains make the best salads – they improve with time, could not be better for you and the possibilities are endless – and what joins & dresses the grains makes these salads something to get to know, and tabbouleh is a great place to start. 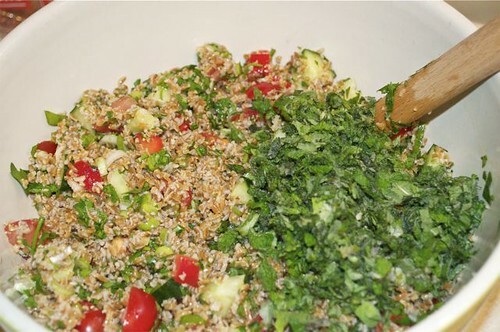 The only things that absolutely have to be in it for it to be a classic tabbouleh, besides the bulgur, is tomatoes, parsley, scallions, mint, lemon & olive oil – for added crunch and interest many recipes include diced cucumbers, green or red peppers, celery, even fennel. 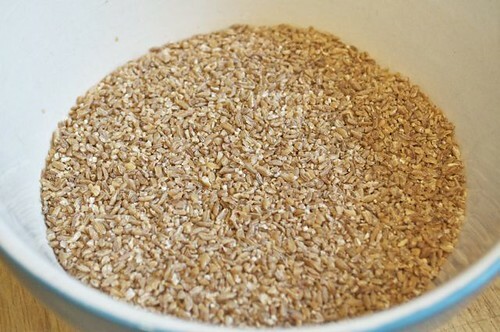 I often springboard from this classic and switch up the grains from brown rice to quinoa to couscous. And feel free to take your tabbouleh for a joyride – add finely chopped/shredded additions like: kalamata olives, nuts, beans, roasted red peppers, red chilis or jalapeño peppers, sundried tomatoes, red onion, roasted garlic, feta or goat cheese, shredded cabbage or lettuce – not to mention a protein like grilled chicken, lamb, shrimp or scallops. 1. 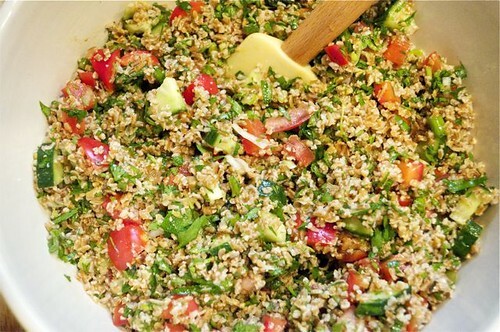 Get bulgur in a bowl. 2. 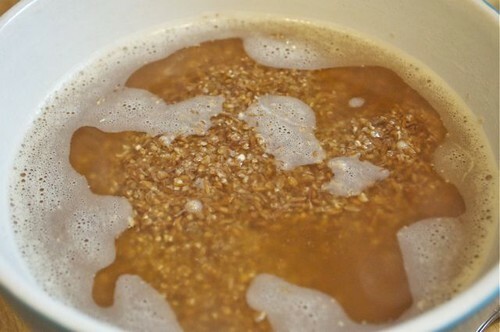 Get stock or boiling water ready to pour on the bulgur – this is vegetable broth so I’m using a pot on the stove. 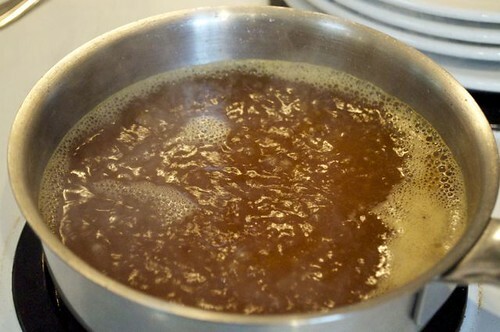 Boiling water straight from the kettle works just the same minus the flavour. 3. 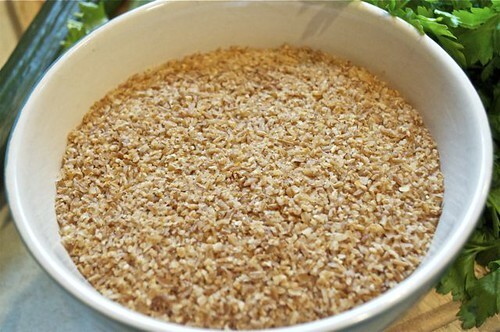 Once boiled, pour the stock over the bulgur and allow to sit for a few minutes until the bulgur absorbs all the liquid. 5. 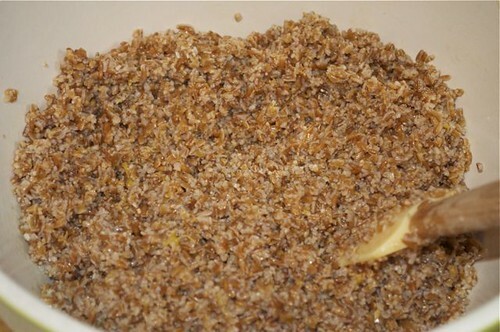 Fluff the bulgur before proceeding. 6. 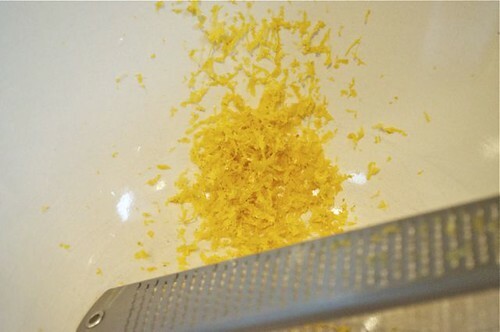 Zest the lemon directly into a large bowl. 8. 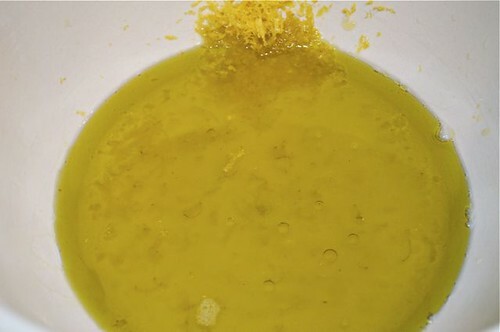 Add the olive oil and whisk to combine. 9. Get your veg together. 10. Dice into similar-sized pieces. 11. 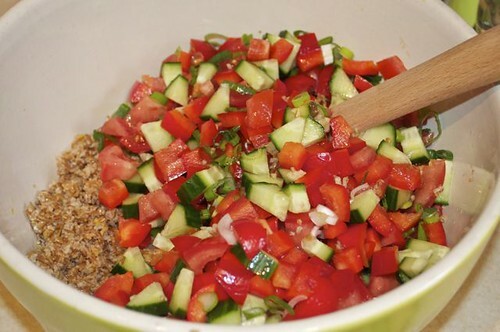 Add the diced vegetables to the bowl of bulgur. 12. 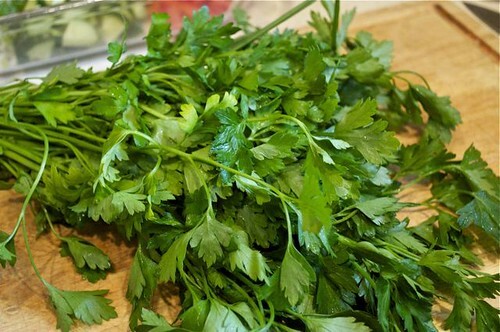 Rinse a whack of flat-leaf parsley. 13. 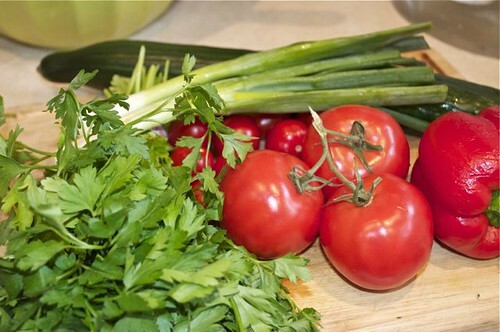 Simply chop through the bunch. 14. 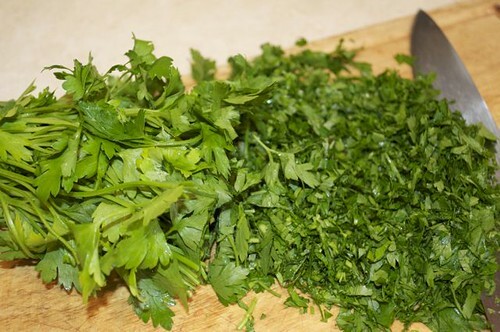 And add the parsley to the bowl. 15. 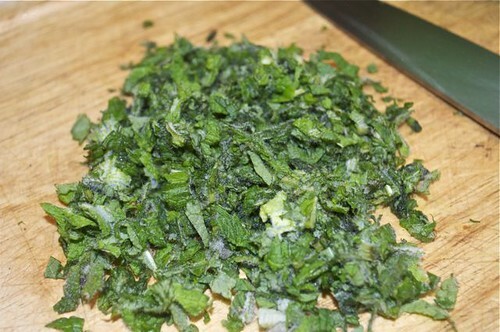 Admire your fresh mint – if you don’t have any, carry on, though it is part of a classic tabbouleh. 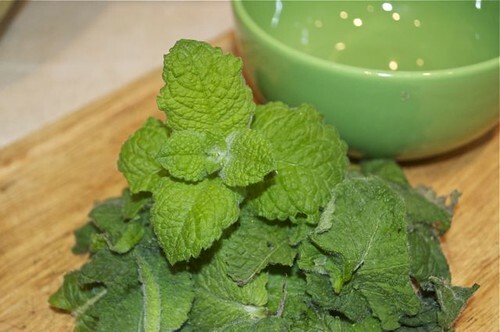 We can have fresh mint on hand very easily – grow a patch– pick a corner of your garden, buy yourself a mint plant, start it in a container that you can bury or it’ll take off like wildfire – the real weed of all herbs! 16. And give your mint a rough chop. 17. 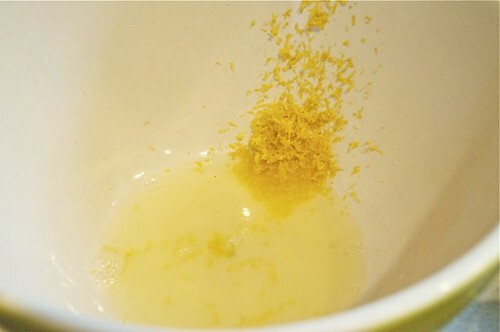 Add it to the rest of the ingredients and give it a good stir and a good pinch of salt and pepper, taste and adjust – more lemon, more salt, more olive oil? 18. 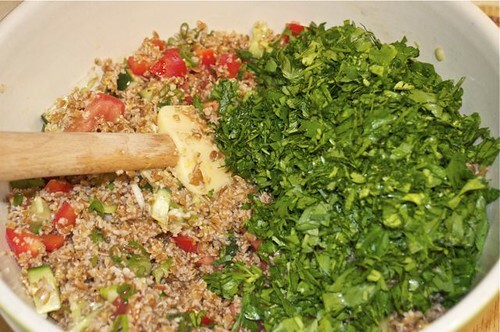 When your tastebuds give their approval, pile it into a big bowl for serving. 19. Garnish with a few mint leaves and don’t forget the lemon wedges – a final spritz is not to be missed. 5. Taste & adjust – add more lemon if you want it zippier, more olive oil if it feels “dry”, more salt – whatever – listen to your taste buds, they won’t let you down. 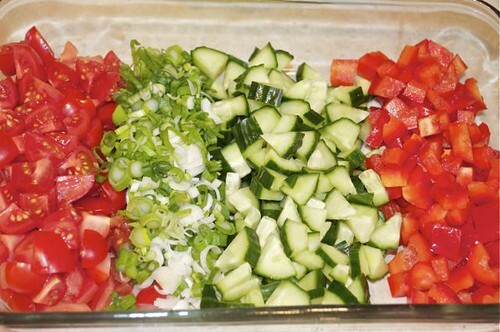 And you may need more simply because you’ve added additional chopped vegetables. 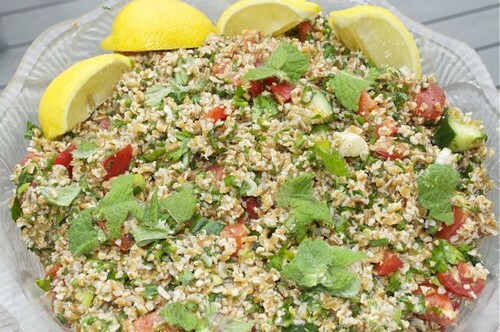 This, by the way, is a great way to stretch your tabouli to feed as many people as you need to!